The girls and boys all arrived at 11:30 am for a Penitential Rite, with priests available to hear confessions. The parish priest had also invited the boys and girls from the other Confirmation classes. On their way back from going to confession, they went into the parish hall and we practiced Christmas carols. We concluded the morning with a short group discussion, reflecting on Advent, preparing our hearts and the personal encounter we should have with the Lord in our lives. 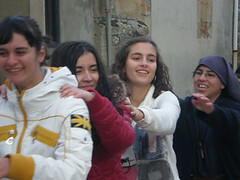 At 1:30 pm, the young people left and we continued on with our activity for the girls. We had a great time with games, contests, and more! We finished the day off by saying good-bye to the Lord in a brief time of prayer in the Church, while the girls offered “the gifts” they had won in the games to Baby Jesus. We entrust the fruits of this new apostolate to Our Lord and Our Mother.